But How’s It Sound on Your Cellphonn O))) ? 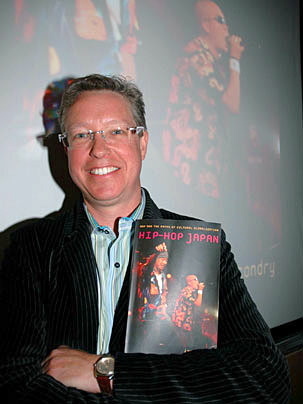 Tonight’s guest at Beat Research is my friend & colleague at MIT, Ian Condry, author of Hip-hop Japan (Duke U Press, 2006). He’ll be joining us this eve to celebrate the translation of his book into Japanese, and he’ll do so by offering a set that traces the broad contours of Japanese hip-hop. 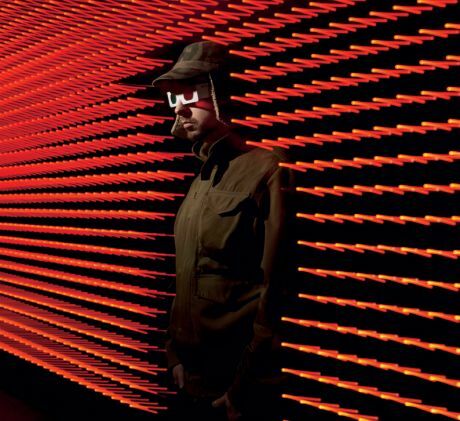 Come on out to the Enormous Room tonight to hear some of this fascinating stuff in motion. Ian will be playing from 10:30 – 11:30 and Flack and I will pick up the slack. 567 Mass Ave, 9-1, FREE. BTW, I gotta report that we have a very exciting autumn at Beat Research. Check the allstar lineup!!!!!! Oh man oh man oh man, r u as psyched as I am? Monday nights RULE this fall. See you 2nite mebbe? Tonight, Axel will be our guest at Beat Research; & Friday, I’ll be guesting at his weekly gig at Grafton Street in Harvard Square, where Keith gets to indulge his penchant for funky disco and boogie jamz galore. As it happens, I’ll already be in the Square on Friday for a symposium on the New Literary History of America edited by Greil Marcus & Werner Sollors, so I’m hoping I can turn the gig into something of an afterparty for some of the heavyhitters gathered at Hahvid this weekend. We’ll see; Keith and I will be dropping some heavy tracks at any rate. I’ve really been enjoying all the feedback I got on my “treble culture” post. One idea that’s been especially interesting is the seemingly common notion — repeated & affirmed by many commenters — that we tend to imagine/assume bass even when we don’t hear it. I suspect that this phenomenon may be at work more frequently than we think. Indeed, I suspect that even when we’re in the presence of a good enough system to “hear” bass, it’s hardly bass at all if we’re not feeling it. Comments from Nina and Beni emphasized this point, but nothing brought it home quite like last night’s Mos Def & Talib Kweli concert at the House of Blues. 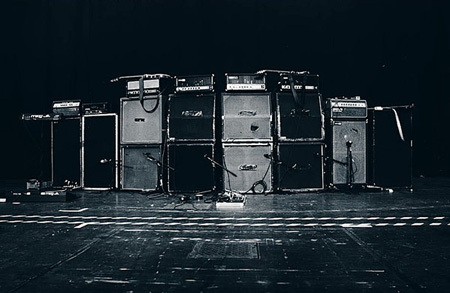 As you can see in that picture above, the speaker stacks at the HoB are pretty damn serious (see the arcing array rising from the stage). Corporate sheen aside, I can’t remember being in a club with a system that pumped like that. 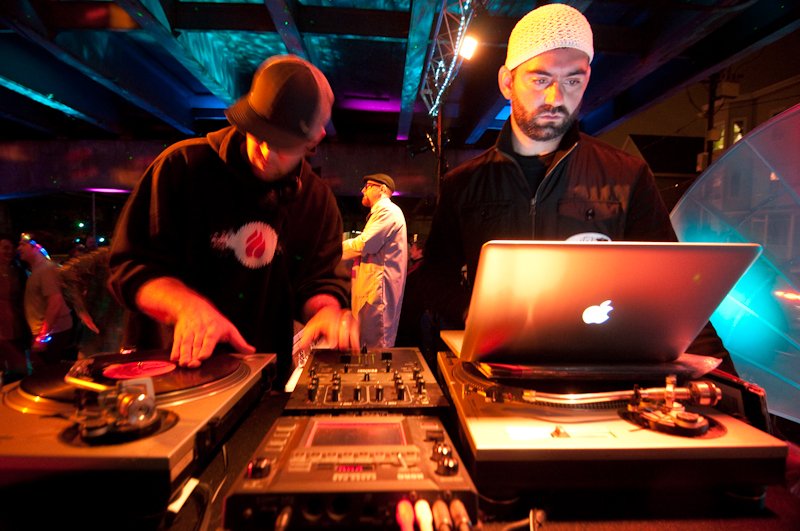 The highs and mids could have used some teasing out — 30 years in & soundmen still haven’t figured out how to mix hip-hop unmuddily? — but the “lows” were perfect. It feels a little odd to call them “lows” actually, since rather than hearing the bass frequencies I felt like I was being inhabited by them, body cavities vibrating in sympathy. There’s no way I could translate this physicality for you — YOU HAVE TO BE THERE, simple as that — but this little video, and the crushing distortion produced by the bass therein, gives some sense — if a kind of bizarro, fractured representation — of what it was like. I’d love to hear more thoughts on this, if anyone has any. I’ll leave you with an apropos photo c/o Botswana brethren, Ruff Riddims. Seeking to push their sound out, they’ve been building their own speaker boxes, which are as beautiful (and, I’m told, as awesome) as the studio they built last year. 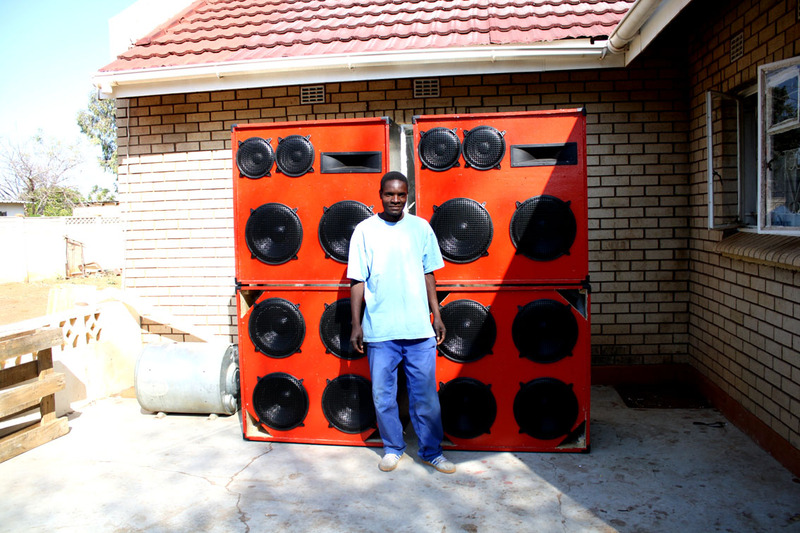 Moemedi, aka Red Pepper, says they’re going to build four more like these, for the other side of the flatbed! me: bredrin, you’re an impresario! me: 200 bricks so far! Ruff: I told the guys helping me that, a journey of a thousand miles begins with one step and they where very motivated and laughed too. What I’d give to feel some Botswana bass bouncing off 4000 bricks! Ben Sheffner is a copyright/First Amendment/media/entertainment attorney and former journalist. Ben is currently working as a production attorney in the NBC Universal Television Group. Preiously [sic], he worked as an associate at O’Melveny & Myers LLP, as Senior Counsel, Content Protection Litigation at Fox, and as Litigation Counsel at NBC Universal. From July-November 2008, Ben served as Special Counsel on Senator John McCain’s presidential campaign where, among other responsibilities, he handled the campaign’s copyright, trademark, and other IP issues. But what of her education? Sheffner makes a big point of alleging Shante did not receive her Ph.D. and is not listed as a practicing doctor. Gotcha again! (Sheffner seems to fetishize this “Doctor” thing. Maybe he’s sharpening his knives for Dr. Dre next?) But according to her, Shante has received her BA and MA degrees. Her passionate message in her talks to hip-hop youths across the country is about the importance of education. Clearly much more of the story here is begging to be told. We think that’s all pretty thin for a so-called exposé.